South Africa is one of the premium tourism destinations in the world. We like it so much that we are delighted to offer this special rowing travel experience in this exceptional country. This trip is timed to coincide with the spectacular spring wildflowers in the Western Cape. Enjoy a concentrated dose of rowing on rivers and in coastal lagoons, with time to walk where the flowers bloom in wild pinks, oranges, yellows and whites. And of course we will also enjoy the stunningly beautiful landscapes, fascinating bird and wildlife, the warmth and culture of the people and world-renowned wine and food that South Africa is known for. Extend your trip in two ways. Before the rowing, join us for hiking (with more wildflowers, of course) in the spectacular Cederberg Mountains plus cultural visits to a roobois farm and to see Saan rock art paintings. Enjoy extra rowing with a three day add-on in Simon’s Town, on the peninsula south of Cape Town. 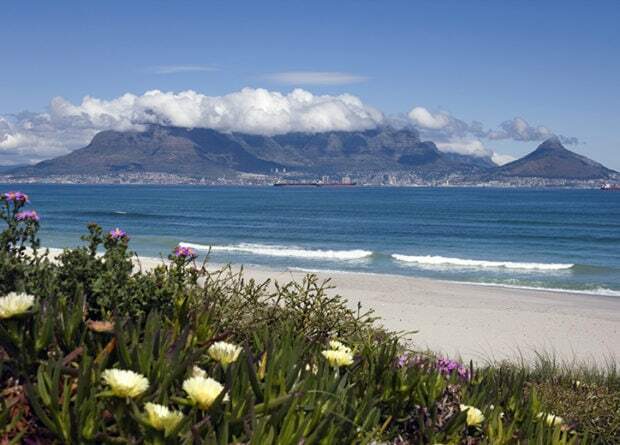 We will enjoy long rows on False Bay, maybe down to the very tip of Africa or perhaps past spectacular Chapman’s Peak. See another side of South Africa. Only available upon request in 2019. The flowers typically bloom in late August and early September. Contact us to let us know that you are interested in this destination and for further details on the trip.